While many people still consider dental implants the "new kids on the block" in dental restoration, they're now in their fourth decade of use. And since their inception implant technology has continued to improve and revolutionize how we replace missing teeth. Implants are a different "species" compared to other restoration methods. 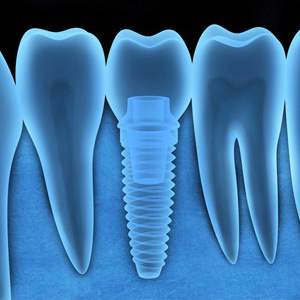 To be precise, an implant is a tooth root replacement—usually a titanium metal post imbedded directly into the jaw bone. Titanium is not only a biocompatible metal, but bone cells naturally grow on its surface to create a strong and durable hold. It's this secure hold that's most responsible for implants' high long-term success rate. But we should also credit some of this success to the steady stream of advances over the years in implant construction and supporting technologies. For one thing, we're now more accurate and precise with implant placement thanks to advances in computer tomography (CT) and cone beam CT (CBCT) scanning. These digital processes merge a series of images taken by a special camera to form a three-dimensional model of the jaw. We can manipulate this model on a computer monitor to view it from different vantage points. It can help us locate and avoid anatomical structures like nerves and sinuses when determining where to place a future implant. CT and CBCT are especially useful when there's a concern about adequate available bone, a necessity for stable implants. Technology has also improved how we create surgical guides, often used during implant surgery to obtain the most accurate results. Surgical guides are custom-made devices that fit over the teeth with the drilling locations for the implants marked on them. Recent advances in 3-D printing have made these guides even more accurate so that they fit more securely in the mouth. This greater stability increases their accuracy during the drilling sequence during surgery. These and other advances are helping ensure every implant is a success story. The end result is both a functional restoration and a beautiful smile.